The recent "atmospheric river" that soaked California, as seen in a forecast | Watts Up With That? An unusual April storm system brought heavy rains to northern California during the beginning of the month. The soaking rains caused localized flooding and even melted some higher elevation snow, but also filled reservoirs in northern parts of the state. This image shows the total precipitable water forecast to be in the atmosphere at 11 a.m. on the West Coast on April 6, 2018 using data from the Global Forecast System model run at 0600 UTC April 6 which, translates to 11pm April 5, West Coast time. What is precipitable water? It is an estimate of how much water would be present if you could snap your fingers and turn all of the water vapor in the column of air above your head into liquid. The darker blue colors in the image show where the atmosphere was chock full of moisture, while blacker areas were regions where the atmosphere was dry. The atmosphere above the tropical Pacific is packed with moisture, but there is also a narrow bridge of moisture connecting the tropics and the West Coast of the United States. Bridges like these are known as atmospheric rivers, though they are sometimes called a “Pineapple Express” when the moisture flows from the area around Hawaii. This event brought four to six inches of rain in 48 hours from April 6-7 across northern California. Most of the heaviest rains (more than six inches) fell along the northern Sierra Nevada Mountains, although coastal areas north of San Francisco also received around six inches. While there were reports of localized flooding, the rains were mostly helpful in filling reservoirs with water that will be used during the state’s dry summer months. The West Coast experiences a handful of atmospheric river events each winter—the season during which California gets most of its precipitation. 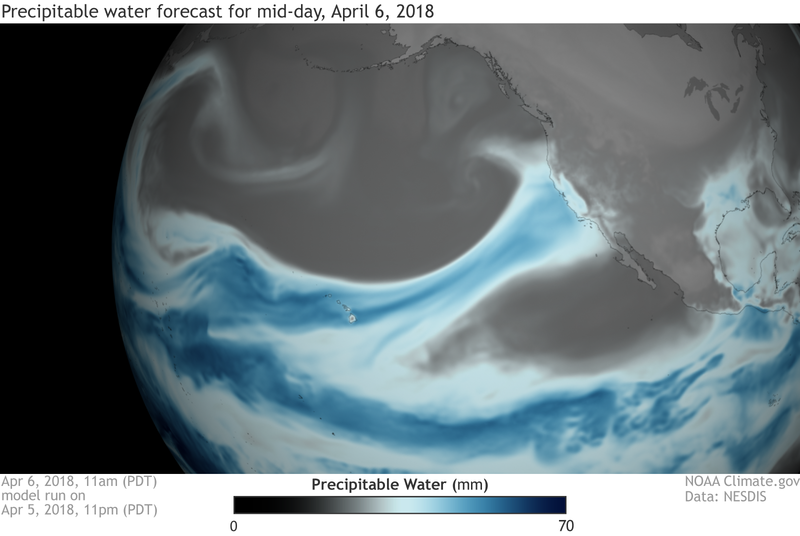 This atmospheric river was unusual not only for occurring in spring, but it also brought record-breaking moist air. Weather balloons launched from Oakland, California, measured the highest precipitable water amounts on record for any months from November through May. However, just because an atmospheric river brings record-moist air doesn’t guarantee it will generate record amounts of rain or snow. In this case, the atmosphere was able to squeeze out enough rain to set daily records in places like San Francisco. Cities along the West Coast rely on atmospheric rivers to bring 30 to 50% of the total precipitationthey may receive in a year. Because of their importance to regional water supplies, NOAA’s Climate Program Office devotes resources to studying atmospheric rivers. The goal of this research is not only to further our understanding of atmospheric rivers but better predict them weeks to months in advance and work with communities to help them make better use of predictions and warnings. April 11, 2018 in Rainfall, Weather. ← What Did Shell Know and When Did They Know It? The upside in addition to full reservoirs, Moonbeam’s Marxist wet dreams of re-imposing revenue producing drought controls on people and businesses got put on hold. Brown and crew will release all that water for the delta smelt. Maybe. He needs those drought revenues to keep Government waste going strong. Another cold fronts will provide further rainfall in California (snow in the mountains). temps are dropping back close to freezing for the next two nights. Three nights ago it was 51 F. My poor lime tree does not know what to do. This is the first year where it has yet to put out blooms. Typically, it would bloom around late January or February as it did every year for the last 5 years. Climate change is here. The reservoirs are filled not only in the north. I guess this is the newest, new normal for California. Where will this end? If it’s not sunny, it is raining all the time. There’s just no pleasing some Californians. It is sunny and rainy in Potch too. Soon we’ll be surfing over the Vredefort Dome. This is normal, and there is decidedly nothing new about it. It only seems new to the unaware and utterly clueless. Spike Jones was such a genius–he could even explain the weather! As always, meticulously rehearsed, and executed with economy and verve. Thanks for posting! Thanks for an interesting post, Anthony. Where I live, about seventy miles north of San Francisco, we got eight inches (200 mm) of rain in 24 hours … flooding, roads washed out, nothing but fun. But it definitely filled up the water table. I like to play around with 1000, 850, and 700 hPa to see more of direct ground effects. Multiple windows open and +3 hr increments and I can outdo my local forecasts most of the time and often by a couple of days and accuracy in timing even better. My quantity forecasts are rated as: 1) a shed load, 2) a good bit, 3) not much, 4) what are those talking head clowns smoking? Learned to read and call it along with weather station radar in another tab along with nullschool. When and where the cold air clashes with the warm moist air there will likely be weather you can count on and measure. So, you trust only the GFS? 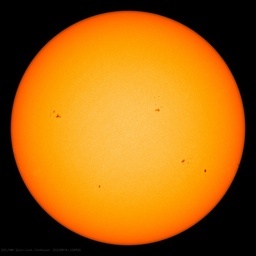 @ JKrob …I find it an extremely useful tool for observing ongoing changes. @goldminor – whatever turns you on. nullschool is just extremely simplistic in what it shows…but ‘pretty’ in how it does it. How about a list of all the stupid things governments in CA spend money on fighting AGW, that they could use for increasing reservoir capacity. 1 ) Painting the streets white. How much work was done evaporating and transporting all of that water, what 1,000 miles? Imagine just the work to pump that much water that far! An unusual April storm system brought heavy rains to northern California during the beginning of the month. Unusual? Uncommon perhaps. And to draw a finer point, less uncommon in early April and much more uncommon later. The Pacific/West Coast winter precipitation pattern is far too variable to constrain it’s extent to arbitrary human defined “months.” I wouldn’t call this event “unusual” unless it happened May or later. Note; the Oroville Dam is “low” as a management issue as the repairs are being effected. It’s the ‘Lake Woebegone Effect”, where ALL the weather is unusual. … by top statisticians … really top people. Top people. One could still say “men” … back in the 1980’s. Oroville reservoir is currently at 803 feet, and holding, which is 27 feet below the level at which they would use the newly rebuilt spillway. A blogger who lives in the High Sierras just above Oroville Dam called it the Pineapple Express, coming out of Hawaii. He measured 5.5 ins. Oroville doesn’t need a lot of that. He contributes well to the Oroville debate. It may be raining, but it is Gov. Moonbeam and the socialist democrats that are soaking California’s citizens. Too funny, and too sad. California reservoirs are at 110% of normal and 90% of capacity. Some have been releasing water. Governor Moonbeam has moved on from drought crises to moving water from Northern California to Southern California with tunnels. First positive action taken with water that I can remember. Just take a look at the cdec site on reservoir capacity. Yep. That SURE looks like a DROUGHT … which the oh so “official” Drought Monitor had 80% of CA draped in BRIGHT YELLOW “drought” conditions just two weeks ago. And the EXTREME desert areas of the State in BRIGHT RED “drought” conditions, because there has been only 1.75″ of Rain instead of the Average 1.85″ of Rain… in… the… DESERT !!! As Sam Kinison would scream … THAT’S why they call it A DESERT !!! By YOUR government. By YOUR “science” Agencies. By YOUR public institutions of higher propaganda, er … learning. What I find most interesting about this river is what’s happening under it, on the ocean’s surface: http://weather.unisys.com/surface/sfc_daily.php?plot=ssa&inv=0&t=cur, The ocean under the river is cold. “Atmospheric Rivers” – well, what an interesting analogy! Oh, wait, it can even be taken literally! And, when did it become obvious that there are literally rivers in the atmosphere? Well, how smart and clever we modern scientists are. Oh, wait – the Bible clearly identifies the atmospheric rivers in Psalm 46, written possibly as recently as 400BC, although most likely written centuries before that…”The streams of God are filled with water,” here obviously referring to atmospheric moisture that provides, not a genuine stream. “Praise awaits you, our God, in Zion; to you our vows will be fulfilled. You who answer prayer, to you all people will come. You care for the land and water it; you enrich it abundantly. “All streams flow into the sea, yet the sea is never full. April 12, 1974. Harry Geise, then KCRA guru had predicted good weather. 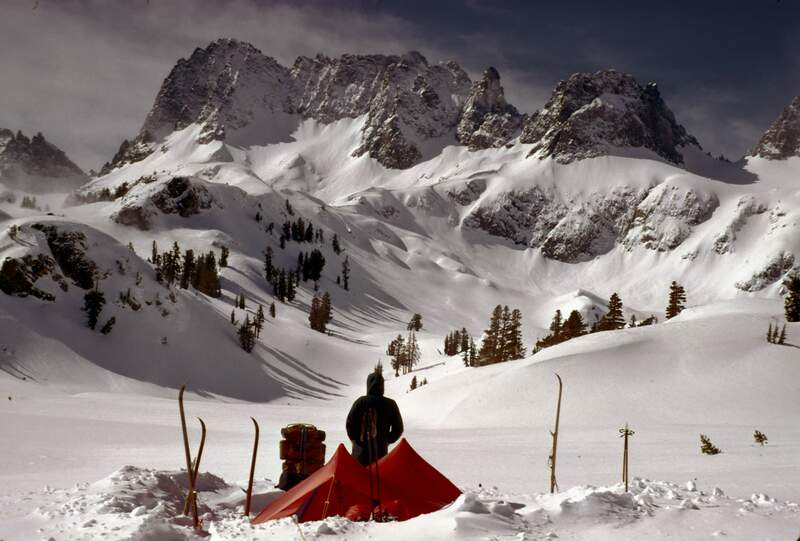 We set out from Mammoth on mountaineering skis to climb Mt. Ritter. Beautiful spring weather. April 13, 1974. We are driven off Ritter an hour short of the summit. Spend the next three days in the tent, arising at least once a night to dig the tent out with a pot. Above was our camp at Lake Ediza during a break day one. Had to dig our car out with the same pot. March 29, 1982. Left my taxes in a family cabin at a place called Kingvale to go skiing with friends at Alpine Meadows. March 30, 1982. Had the best powder day of my life, in spite of having travelled to far more auspicious places. March 31, 1982. Avalanche buries the lodge at Alpine. We were snowed in two days and escaped by driving around North Shore and over Carson Pass. Had to drive back up to Kingvale to recover my taxes. Ten feet of snow at Kingvale. I do not see anything particularly unusual about this “late season” storm. A human being can see everything as “unusual” if not “absolutely unprecedented in modern times.” Depends on how hard you squint. Just another example of Jerry’s “drought” and “drought-like” conditions. A couple years back people all talked about the permanent drought. I’d ask why they thought that to be the case and they just looked at me like I was a idiot. There’s nothing but true believers in this state. Now, of course that act like these storms have never occurred before. There is a disturbing need in people around me to embrace and desire a dystopian future. Surely the simple explanation is that most people are too stupid to understand, or so weak willed hey would rather follow the recieved social group wisdom than fid out the facts. That is why most of ur government and political system in Western Democracies are so corrupt and dishonest, the governmenthas no problem selling any old story they choose to the majority Why independent minded intellectuals are the first target of any totallitarianism, especially of the likes of high priests of required belief like Michael Mann, who have taken the political Dollar to produce fake science that makes them and their masters rich at public expense, by law..Good old time region business, 21st Century style. Yes, understanding and predicting all that rain is nice. But it also helps to capture some of it efficiently enough to satisfy water needs, instead of forever imagining what global warming will or won’t do to rainfall patterns in a century’s time. I can’t help thinking there is an imbalance that needs correcting, and most of the people who do all that well paid predicting probably don’t have to spend too much time worrying about the size of their water bills. One can also go into some Central Valley Walmarts during the summer heat and find them full of poor immigrant families who cannot afford air conditioning, something that is not needed so much if you can afford property close to the ocean.